I tried shopping for food at Wal-Mart today, and it was almost a complete waste of my time. I knew they carried Stoneyfield Organic yogurt so I assumed they must at least have a couple of organic cheese options and maybe even some other inexpensive organic stuff. With the exception of some organic brown rice (which I didn’t buy since it wasn’t quick cooking) and some organic Pam cooking spray, the yogurt was just about the only thing that made it worth going there. And who wants to traverse through a football field size store to save a measly buck or two on three things? I was actually a little relieved I don’t have to go back anytime soon! I also heard the chicken is buy one get one free…we will see how much $ I have left! Thursday: Kids eat free at Earthfare night (and my husband will be gone)! In other news I would love to meet those in the Charlotte area at the Hillbilly Produce Fall Festival this Saturday! It is from 1:00 – 3:00 P.M., and I am going to have a table set up so I can chat with people about eating real food. And if anything just stop by for some free samples from several local farms (including Baucom’s Best and Grateful Growers) and to listen to the Bluegrass Band that will be there. Also, I figured why not combine real food with some exercise so the weekend after that I am running in the Brookhaven 5K in honor of our friend’s son Jake Pritchard. He is 6-years-old and received a heartbreaking diagnosis of Duchenne Muscular Dystrophy a couple of years ago. Our dear friends (his parents) do an amazing job of organizing this annual race, which raises money for finding a cure. It just breaks my heart every time I think about it so I of course want to do anything I can to help them. Which is why I started a little fund raising page (http://tinyurl.com/2dzdot6)! I am only about halfway to my goal of raising $300 and would absolutely love your support if you are interested in making a small donation. Every last dollar counts!! I haven’t ever seen you mention Trader Joe’s. . . they aren’t my favorite (they don’t carry anything local), but oh so much better than Walmart! I personally buy my food from local farmers and markets as much as humanly possible, so I understand that you don’t want to pump your girls full of pesticides! They have TJ brand crackers, coffee (very good, actually…and many fair-trade options), oils, organic yogurt, organic sour cream, non-rBst cheese, organic frozen veggies, organic fruit and veg…. I would think 99% of which is cheaper than EarthFare. I don’t recommend much of their meat (but then, I buy mine locally), although they sometimes have organic grass-fed beef. They have organic chicken at an okay price. . . but organic doesn’t mean you know WHAT it gets fed. :-\. I agree Trader Joe’s has got to be better than Walmart…I think I will be able to try shopping there next week! I am trying one new store a week. I appreciate your feedback and while we think it makes sense to avoid GMOs (and really all things conventional) we are also realizing we cannot do it 100% of the time on a budget. I do think anything in moderation is probably okay (that large container of oil would last us a very long time), but I plan to rethink what kind of oil we use though based on everyone’s comments. Thanks again! I also shop at Trader Joes for a few things, but mostly for things that I can’t find locally. They carry a lot of organics and their processed foods are slightly better than what you’ll find elsewhere. I don’t like to buy out of season and from thousands of miles away, but when I do Trader Joe’s seems to have the next best thing for a lower price than you’ll find at most stores. The service and employees are quite exceptional!! Oh and by the way, they are opening a Great Harvest Bread Co. right next door (Mallard Creek location). I am not sure if you ever shop at Harris Teeter. They are not quite as expensive as Earthfare, but still high and they carry some specialty health food items that you might not find at the other big chains. They frequently have sales on the really good stuff, like King Arthur flour and Spectrum’s organic products. I’ve been stocking up on jars of Spectrum’s Organic Coconut Oil for $7.99 ($1 off). Most of the time they aren’t advertised, which makes for a nice surprise. This probably just brings it down to a reasonable price, but that’s better than paying too much. I’m noticing this more and more at my store, so they may be responding to increased demand. They also have a few local and regional produce items. I bought local kale today. I do wonder sometimes whether it’s just my store though, or all HT’s in general. Between Harris Teeter, Trader Joe’s and the farmers market, I usually do okay. Unfortunately, I don’t have any luck at the Bi-Lo closest to my house, as others have. I’m going to try your whole wheat cheese biscuits this week. It’s been a long time since we’ve had biscuits so I’m looking forward to it! Thanks for the comment! I did end up trying HT last week and as far as things being cheaper I think it is hit or miss. Some things are definitely less expensive (especially if it is on sale), but for example the ground ginger (which was conventional) was 4 or 5 dollars at HT and I found the same thing (in organic) for 2 or 3 dollars at EF. Unfortunately it takes A LOT of time to go to different stores to get the very best deals at each place so I hope to figure out a way to do all of this efficiently!! Hope you enjoyed the biscuits! Do you have a Big Lots near you? because I find a lot of organic products- you just never know what you are going to find- and the prices are rock bottom. I get Cascadian Farm cereal there all the time. Also Costco carries more organic stuff than Sam’s Club. We do have a Big Lots and the thought has never occurred to me to check it out…who would’ve known they have organic stuff! I’m not crazy about WM either, but my local WM carries organic onions for not much more than the non-org…and I eat a lot of onions so I was happy about this new item. I am assuming you were referring to the Yoga brand organic rice? It’s really good and with a rice cooker it’s done in no time while you work on other stuff..I make a batch per week for the 2 of us. The brand Cabot has a good cheddar cheese that is rBGH-free, and if you go to coupons.com you can print a coupon for $1.00 off any American brand cheese 2 lbs or larger. I’ve used this coupon for a while now. On a last note, have you ever tried 8 O’Clock brand coffee? It is absolutely the best and the price is a fraction of Starbuck’s. I’m from Colombia, SA and this particular brand is even rated amongst the top coffees by the “cafeteros”…coffee plantation growers. Oftentimes they have $1.00 coupons on their bags that you can use when you buy two bags on future purchases..and when Publix (my favorite grocery store) has BOGO, I used the $1.00 coupons on top of the BOGO deal and end up only paying $2.00/bag….the cashiers think we only consume coffee because we stock up big time. We only buy the whole bean because when you buy pre-ground coffee you end up having to use more because it’s not fine enough. I love Cabot brand cheese too, and if I can’t get organic that is always my first choice! So that is good to know about the coupon. Thanks for the other tips as well. My husband is the coffee drinker in our house so I will see what he thinks about the 8 O’Clock brand. Thanks for your comment! I am not pushing, just offering some information about what that Canola Oil is and how it was made. Canola, Corn, Soybean, Cottonseed and Safflower oils are all made this way and are largely GMO. We have gotten them out of our house, and I am working on isolating all ready made foods that contain them. But these oils are everywhere and in everything! We are now using butter, olive oil and coconut and recently when I made my own beef stock I saved the beef tallow and I am using that for satueeing too. These are all fats that my great grandmother would have used (or at least known about). Canola was “invented” in the 1980’s. Check my sources. I agree with the comment about canola oil. I use it occasionally, but at this point it’s just because I have some left in my cupboard. I don’t think I’ll be buying it again. When and if you do buy olive oil though be careful how you cook with it. I use sunflower at the moment, but I’m not even sure about that so I use very very very little. Also you can save money with the olive oil spray buy going to a dollar store and getting a spray bottle and filling it with your own oil. I’ve heard you can mix it with water and just shake it before you spray but I don’t know how that works. Just being able to spritz it on something is good enough for me. I’ve been watching much more carefully how I spend my own money since you’ve started this and I can’t believe how expensive those sprays are – especially up here in Canada. Ugh. I’m not sure how things compare(I live in Canada and pricing on food is much different). But isn’t quick cooking rice more expensive than regular rice? Even if you get a big bag, it is more money all at once but it will last you so much longer than a tiny little box. Even if you can make one big purchase per couple weeks. A large container of rice one week, good oil the next, etc. It will be cheaper in the long run even if you have to make small sacrifices at present. Also, if your girls don’t mind beans you should really check them out. Even if they do mind them, check them out! Very cheap and awesome for you. You can buy dried beans and soak them overnight and then cook them. And whatever you don’t use you can throw in the freezer and have them for next week or whenever. You can make some awesome veggie burgers, hummus, red and yellow lentils and green split peas can be made into soup(they kind of disintegrate and make the soup thick), green lentils even taste good in pasta sauce. You can make meatless chili with lentils and beans(or just reduce the amount of meat you use and save half a pound of meat for another meal). Thanks for your comment! In regards to the rice, I think the price difference is minimal between quick cooking and regular. I still buy the regular brown rice too, but it seems that I sometimes make dinner and decide to incorporate rice “at the last minute” so I need quick cooking just in case I don’t have 40 – 50 minutes to make it. Also, I am going to make an effort to use beans more often. My girls aren’t really the problem…I am the one who is not a big fan! I know this post is nearly a year old, but I wanted to advocate for a rice cooker. I make a few cups of brown rice at my leisure, we eat what need and the rest goes into a container in the fridge for the next occasion. I’ll even have it for breakfast under a couple of eggs! It’s a great staple to have around when already prepared. Did you know you can freeze cooked rice? I always make a huge pot of rice for us and freeze the remainders in smaller packages. It keeps very well and does not taste like it’s been frozen. Great, thanks for the tip. I will have to give it a try. I would really love to know what “people of Wal-Mart” means. Is this a humorous reference to something you posted earlier? Or is it meant to be interpreted as snobby as it sounds? I enjoy your blog, but this rubbed me the wrong way. I was actually referring to a website that I thought was pretty well known…the site is called People of Walmart http://www.peopleofwalmart.com I certainly did not mean to offend anyone. The reference to that website has been removed. I read through your other recent budget posts and comments and am also surprised you don’t shop Trader Joes or Costco! I guess if you are new to the budget game these are stores you might not be as familiar with, but you need to go, especially to Costco. It’s not local, but they even have organic chicken and grass fed ground beef for great prices. All of their frozen fruits and veggies are organic, and CHEAP! I haven’t shopped at Earth Fare since I was working. It’s just not worth it – they mark up absolutely everything to the max, and you can find much better deals on still healthy, whole foods at other stores. Costco will let you walk around the store w/o a membership (you can’t buy anything), or you could ask a friend w/a membership if you can tag along on a trip. I think you’ll be blown away by how much you can save. So many people have mentioned Costco…maybe I should to what you suggested and walk around with them to check it out. We do have one close-by! I found out that all Kroger store brand dairy is rGBH free – their cheese, whipping cream, butter, and Private Selection ice cream (plus the milk) even though only the milk is labeled as such. WalMart brand (GV) milk is hormone free but I don’t know about their other products. Canola oil is one of the compromises we make. It’s either that or peanut oil around here, anyway, and I haven’t sorted out all the issues yet to determine which is the “least worst” option for us. I’ve been writing about WM lately and have a store tour with the regional director coming up (I was featured on ABCNews.com for a piece I wrote about why I don’t shop at WM very much any more). Is there anything you’d like me to bring up with him? I have a series of posts about it on my blog and already have a list of complaints from other moms w/blogs ready. That’s cool you are meeting with Wal-Mart and congrats on the ABC news piece! I appreciate you asking if I have input, but my sister-n-law actually works for their corporate office as well (doing PR) so I suppose I could go that route if I really had something I needed to share. And on a side note I have a cousin-n-law who works for Kraft! So let’s just say we won’t be talking about food during any of our next family get togethers :) In regards to Wal-Mart though my conclusion has just been that we (and people who eat like us) are probably not their target market, which is totally fine. I am glad they are at least planning to expand their local/organic line especially since they are so powerful! Great job taking on such a challenge after your Real Food endeavors. I’ve been doing something similar for a few months now. My husband and I are on $75 a week for the two of us. One of the biggest eye openers is that short cuts are expensive and preparation is key! It may take 45 minutes to cook up a pot of brown rice but its worth it. You can freeze the leftovers and then you’ve got your “quick rice.” I’m surprised you haven’t made it to Trader Joes yet. I don’t buy any of their produce or meat but for organic staples they are the GO TO store. I’m in the DC area (used to live in Charlotte) and instead of Earthfare we have Wholefoods. Its just as expensive so I only go there for select items that I can’t get at the local farmers markets. Good luck! Thanks for your comment! I am going to try Trader Joe’s next week since everyone has been commenting on it so much. I agree that their meat and produce are lacking, which is why I was never a fan before. But, as you said being on a budget is more work so I just might have to shop at more than one store every week now! Just an FYI: The Food Lion near where I lives now carries Stoneyfield and has the 32oz big yogurts for 1.99. I almost fell over and figured it was just priced incorrectly, but rang up at 1.99!! Best deal for organic yogurt ever! I would check Food Lion for the yogurt! Thanks for the tip…I didn’t know FL had organic stuff! Our Wal-mart has a pretty broad selection of organic (at least based on the labeling) items, and they seem to be adding more pretty frequently. I think they just buy product at a volume that is beyond what most organic dairies, farms, and suppliers can keep up with. Ouch, Lisa. Lots of people eating healthy and locally from their Walmart. In fact, the Mart just announced today a program that will double the amount of locally grown products. Thanks for pointing that out Cindi because I had not heard about the announcement yet. I am absolutely thrilled that Wal-Mart is responding to consumer feedback. And I know that bumping up locally grown products to 9% may not sound like a big number, but since Wal-Mart is so huge it really is much more impactful than one would think. I am always open to hearing the opposing argument so thanks again for sharing! Speaking of Wal-Mart expanding…the new one that opened just south of Ballantyne is amazing!!!! SO much organic and lots of higher end choices that any other Wal-Marts. As a matter of fact, I read their “grand opening” article in the Charlotte Observer and they are using this new store to test if higher-end and organic could become a bigger part of their sales! woo hoo! Seriously, this Wal-Mart is GREAT! Good to know Cori…I am glad consumer demand is forcing them to offer more organic choices! I think organic selection varies by store. The stores in my area, for example, pretty much only carry organic bagged lettuce. I think it’s great that WM is going to sustain local farmers – but let’s not get ahead of ourselves. They’re going to double the amount to 9% coming from local farms (defined as ‘in the same state’) and the goals were just announced, with full implementation by 2015.
they released the list of names from the PS hack…. Effectively offered facts in this posting, My spouse and i prefer to go through this type of equipment. The grade of articles will be excellent as well as the conclusion will be excellent. Thanks a load for this post. Pretty element of content. I simply stumbled upon your site and in accession capital to claim that I get actually loved account your weblog posts. Any way I will be subscribing on your augment or even I achievement you access persistently rapidly. This is the appropriate blog site for any individual who needs to uncover out about this matter. You recognize so significantly its almost hard to argue with you (not that I truly would wantâ€¦HaHa). You undoubtedly set a new spin on a subject thats been written about for many years. Fantastic things, just fantastic! I suggest you have more than one. I use two, and they both will spot things the other ‘misses’. It’s appropriate time to make some plans for the long run and it is time to be happy. I’ve learn this post and if I could I desire to counsel you few attention-grabbing issues or advice. Perhaps you could write next articles referring to this article. I desire to learn more issues approximately it! Thank you, not all Walmart shoppers are on People of Walmart! You will also find my 5’4 125lb self in there all the time. My husband works at Walmart, so with their low prices and his discount.. some months it is all we can afford.. especially since we are a one-income family. I am a student/stay at home mom.. a lot of the time we can’t afford places like Whole Foods, The Fresh Market, or Earth Fare. FYI – Walmart’s own brand Triscuits (Woven Squares) have the exact same 3 ingredients as the real deal, only they’re a fraction of the price! Hi all. Just found this site and really love it. I do feed my children natural foods and made baby food for both of them for 2 years. We own no canned items, pickle veggies ourselves, make our own desserts — and we depend on our farmer markets for everything but milk and cheese. And I do not like Walmart, let’s just put it out there, for more reasons than I care to share. BUT, I have to say, some people just don’t have the choice and have to “traverse” a football-field sized store to save a buck or 2, and yet they still may be interested in creating a healthy food routine for their family. It’s comments like this, or declining snacks and meals at others homes and events (bdy parties, playgroups, etc) that make this “lifestyle” and those of us that live it seem, well, snobby! I get what you’re trying to do here, but be inclusive, not exclusive. I’m enjoying all of the different posts as you’ve journeyed the last couple years. Thank you for sharing the journey so others can learn. I am hoping someone will respond to this thread. I’m fairly confident I read in another of your posts on ths site that we should never use canola oil – only use olive, coconut, butter and ghee. Did I miss something? Or did you buy the canola and make this post before you decided against it? I’m a newbie trying to make better food choices for my family. So clarification would really help. Blessings! And thanks again! 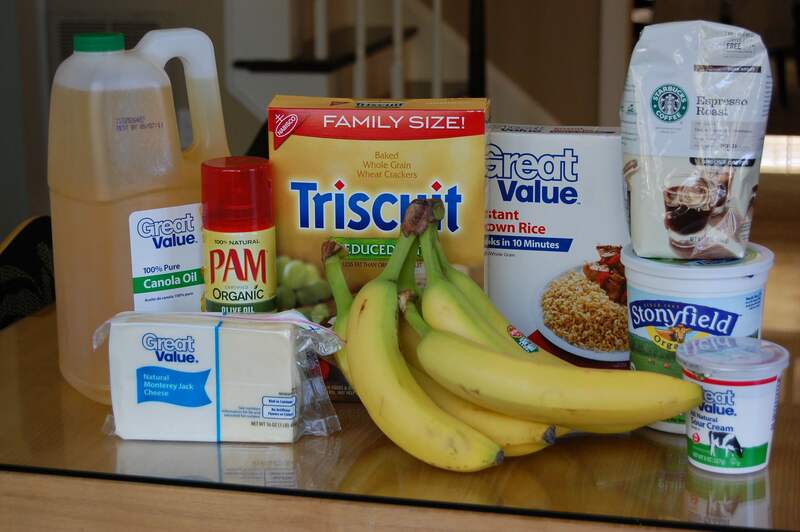 I have been eating real food since march and I find it pretty easy to feed a family of four on $125 or less a week. I budget $150 but never spend that much and if I stick to my list I could prob spend less than $100. I live in a small town in Alabama and the nearest Whole Foods is an hour away. I am fortunate enough to live 5minutes from our local dairy so all of my milk, butter, and cheese come from there. A friend and I drive over to Georgia twice a month to whole foods which is almost a two hour drive but we really love the Great Harvest bread so we just make the trip :) it definitely takes some planning on my part but I get it done. I haven’t had to shop at walmart in months. I have found that Publix has a pretty decent selection of organics and also some grass fed beef and bison. When I’m in a pinch I know I can go there. Unfortunately not everyone is able to shop at health food stores and walmart may be the only other option. Thankfully they are starting to offer more organics and hopefully will bring in more local produce. I think for those who do depend on chains like walmart, reading labels and understanding ingredients is crucial when adopting a real food lifestyle. I think people can still make a real positive change in their diets regardless of where they shop. I’d really like to learn all I can and you being from my area would be really helpful. Hope to hear back from you. Thanks! I know that you want to give the kids variety, because kids can be picky like that, but you can get a whole chicken and rice and vegetables to feed 4 people for < $10 a day and you'll still have left overs. Stuff like ground beef and cabbage is a < $10 meal. AVOID WAL-MART, which you've found out. Ethnic markets are really the best. I agree with your meal choices (especially the chicken and rice meal, which for the two of us last THREE meals-AND chicken stock for another two for under ten-twelve dollars for FIVE MEALS! ), but shopping at Walmart is really my only choice. Its them or WinCo, and they have next to nothing you could consider to be ‘organic’! Some of us really don’t have the choice BUT to shop at Walmart -or raise and grow your own food! So I see the picture of what you bought and trying to determine how some of these things are not processed. Triscuits contain palm oil, which in my opinion is worse than HFCS. Canola oil is a highly processed oil. PAM is made by ConAgra foods and made with canola oil. ConAgra is the processed food kings of the world. In order for a rice to be instant it would have to be processed at some level. This is something I am seriously considering, and I don’t I am just confused because the above picture does not indicate a non-processed food diet. James- my thoughts exactly. From reading other posts, I’ve gathered that she’s learned about oils and such and has since cut them out. This is a great idea, but you only seem to have dinner meals in your $125 budget. What about breakfast, lunch and snacks through out the day? I have two growing boys who are always hungry and this would not be enough to feed them 3 meals plush snacks every week. PS In some parts of the country-parts I lived in-Wal Mart is the only grocer and offers more than it does in areas where natural grocers are present because they have to cater to both natural and organic shoppers as well as thrift shoppers. Just fyi after traveling and living lots of places. Our Walmart has a good variety of organic produce and other products. I’m guessing it varies by your region. If there’s not a lot of demand for organic products in your area, Walmart won’t stock it. I shop there often, and the savings compared to my regular grocery store, (Harris Teeter), is huge! I just had a question about the Triscut ingredients as they are made with soybean oil. Is this considered a safe and good fat? Also I read that if something is USDA Certified Organic, It Cannot and will not Have GMO’s in them. So why is Organic Canola Oil a bad choice? Beware of “Wild Caught Salmon” that is “Made in China”. Maybe it is safe, maybe it isn’t – I’m not experimenting with my family. China has so many pollution issues that I don’t even want to risk buying food that has been exposed to that. I have seen it at WalMart, Food Lion and Aldi’s. Joe – wild caught salmon that is ‘made in China’ is a beef of mine too, as I live on the west coast where local fisherman work. I have learned that ‘made in China’ refers to factory ships that they have at sea that freeze the fish on board, then bring it to the US for distribution. So they don’t actually land the fish, or process it, in China. Why the canola oil? It’s so bad for you.. have you tried the unrefined, organic, cold pressed coconut oil yet? So much healthier and so delicious! I have switched to coconut oil for all things that organic extra virgin olive oil will not work for. The only other fat is real butter. These three options have made a huge difference in our health and our waistlines! I am also curious about the Triscuits.. do they have less than 5 ingredients? I thought they were highly processed so I am wondering what your perspective is on them. I love this blog and plan to follow it now to keep abreast of your findings. Thank you for being health conscious! Triscuits have soybean oil as an ingredient. Am I mistaken, or is soybean oil an okay ingredient to consume? I live in a town with a Walmart, Aldi, Kroger, and Martins. It is a pain having to go to more than one store with four kiddos in tow. Which one of these do you believe to be the best when it comes to finding healthier items? I cannot believe you are cooking with canola oil. It is at the bottom of the list of “good for you”. Coconut oil. Grape seed oil, and olive oil are the healthiest and then butter or grass fed fats are next. Grass fed lard is wonderful! Why buy oil AND Pam? Pam is a waste of money. Purchase a mister and fill with the oil you like. And…when you use real oil and not that cooking “spray” stuff, you won’t have ugly discolored pans. Bonus! What do you do when you only live near a Walmart and a small local grocery store ? Hi Darc. Walmart has gotten better in recent years, actually. They are being more responsive to consumer’s demands for more organics and better quality meats. If you find that not to be the case at your Walmart, I would approach a manager and be proactive. :) Outside of that, do you have access to farmer’s markets? i also order online in my rural area from Amazon or other stores. First, I love 100 Days of Real Food and I appreciate all of Lisa’s work she’s done to communicate and educate. I’ve long had the desire to eat more cleanly, and we have really tried to educate ourselves and do so over the last year or so. But we live in an extremely small town with a single grocery store – WALMART…and a very small one at that. Organic selection is there but minimal and trust me when I tell you it is impossible to buy only organic produce and meats there. It’s even impossible to selectively buy organic for foods on the dirty dozen list. If I want organic fresh fruit of any kind, it is simply not for sale at our Walmart. There are a few organic vegetables and some frozen organic vegetables but nothing like you’d see in a city supermarket. Organic chicken? Forget about it. Not available. We have Farmer’s markets in the summer only…once a week for 3 months and the selection is very very limited…mostly to veggies and some fruit. Though I am often inspired by Lisa’s postings, I do also occasionally feel defeated because I simply am not able to purchase many organic goods. So we do our best in reading labels and trying to stick to as many whole foods or less than 5 ingredient foods as we can. When I read her comments about her having trouble feeding her daughters pesticides, it does insult me a little bit as it would appear that she assumes I must feel ok feeding my children non-organic foods. The truth is, I don’t feel OK about it and I try to reduce it, but I do not have the resources to eliminate it entirely unless I stop feeding them fruit and meat altogether which is not OK with me either. I wish she would consider the jabs some of her words carry to those of us who are doing the best we can…even if the best we can is not up to Lisa’s personal standards. I like reading these articles to help me with cleaner eating, but I understand how you feel. Many people make it sound like you are less of a person or not as into the clean eating if everything is not organic organic of gmos. I have read many articles and they have all suggested that it is not necessary to buy organic with all fruits and vegetables, they say if you stick to getting the dirty dozen organic than you are fine. Some do not have the resources for complete organics and some do not have the funds for complete organics. Some of these people are way over the top, I mean look at them getting upset because she chose an oil at the bottom of the good for you oil list instead of at the top. Come on people. You should be proud of yourself for providing your family with healthy, nutritious meals even if they aren’t always organic. When we were in the position that we wanted to feed our kids more organic foods than those to which we had access in local stores, we started to grow our own. I had less than a quarter acre lot, and had four semi-dwarf apple trees and a sweet-tart cherry. I had strawberries as ground cover in my flower garden, with both june bearing and ever bearing fruit. I had raspberries and black raspberries. I had red currants. I had a veggie garden that ran the length of the south facing wall of our house, and was seven feet wide, with a one foot stepping stone path in the middle. We grew everything we possibly could UP, so climbing cucumbers, pole beans, trellised melons, tomatoes, tomatillos, you name it, if it could be grown up, we grew it. We used runner beans along our front porch, and grew them up fishing line from the dirt at the base of the porch to the wood beneath the gutter. The humming birds loved them, the neighbors thought they were beatiful, and we had beans to freeze. We had peas, and zucchini, and carrots and potatoes. We used drip lines after we saved for them for a couple years. We used leaves from the woods at the edge of our property to dig into the soil in the autumn to improve it as much as possible. We had enough organically grown food to eat well all summer and can and freeze some for the winter. It was several years of investments into improving our property with perennials and saving seeds…but in the end, it made it possible to eat the way we wanted, when it wasn’t available to do so through local sources, and we did so on a very small amount of property. Now we live on 2.5 acres, and are improving the property again. Hopefully in the next few years, we’ll be much more able to eat as well as we’ve always liked.